Are you looking for a dentist in Basking Ridge that will provide you with a beautiful, healthy smile? Your search is over! At Bedminster Family & Cosmetic Dentistry, our goal is to provide you with healthy teeth and gums for life. If you’re not happy with your smile, we can help! Dr. Mike Mavrostomos provides general, cosmetic and restorative dentistry in Basking Ridge with the highest standard of care and efficiency. While we have seen and treated hundreds of patients, every mouth is unique. We will work with you to create a customized treatment plan for your cosmetic dental needs that are as individualized as you are. Our Basking Ridge dental office is equipped with the newest equipment and state-of-the-art dental technologies to ensure your dental solutions are long-lasting and our procedures are relatively pain-free. In addition to digital x-rays and intraoral cameras, we also use DIAGNOdent, which is a laser diode to inspect your teeth that allows us to diagnose cavities early. Our VELscope Cancer Detection Systems also allows us to exam gum tissue and detect oral cancer in the early stages. From the front desk to our treatment rooms, every member of our staff is trained to provide excellent service. We strive to go above and beyond when it comes to patient needs. We invite you to visit our office for a Complimentary Consultation and meet our amazing and dedicated team. Find out why patients love us! Read some of the reviews that have been posted online about us. Ready to turn heads? A smile makeover is possible for everyone. We offer convenient payment options and we accept most insurance plans. You’re just a few appointments aware from the smile makeover you’ve always dreamed of. 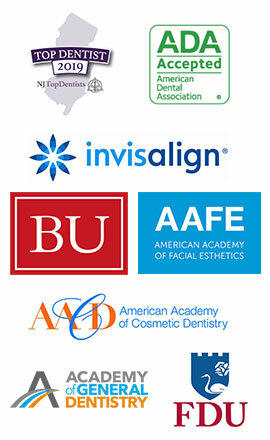 Contact your Basking Ridge Dentist today! Basking Ridge is a small, unincorporated community located within Bernards Township in Somerset County, New Jersey. For those who commute to New York City for work, Basking Ridge is about an hour away by car. It was recently voted among the best places to live in New Jersey. It has a quant historic Downtown area with unique restaurants and shops, top notch schools, and surrounding green areas which make Basking Ridge a great place to call home. “I always receive top-notch dental care here. Years ago I left to go to a dentist nearer to my home, but quickly realized the care here was so superior. I returned and have been very satisfied ever since.” ~Daniel W.
“I traveled five hours from my home in Cape Cod, which I moved to two years ago, because I have always had the best experience with Dr. Mike and the whole team. It was worth the effort to be greeted like a long-lost friend in comfortable surroundings. I then was cleaned, checked, and had a filling without any anxiety or pain. Thank you.” ~Terry F.
“Thanks for the help. I will gladly follow up and become your patient for the outstanding service I got last night. I’m grateful for your help.” ~Wanda F.
Picking the right dentist is important. You don’t want to trust your oral health and appearance to just anyone. That is one of the reasons we offer a complimentary consultation to new patients. If you’d like to have an initial complimentary visit to see if you feel comfortable in our office, we’d be happy to schedule that for you. You can come in, meet us, and discuss with Dr. Mavrostomos what your dental and cosmetic needs are. He can review your clinical situation and any x-rays you bring. It is a great way to see what our philosophy is and if it fits your needs. Then, if you’d like to proceed with a comprehensive examination, you can do that.